Models walk the runway at Prabal Gurung show during New York Fashion Week: The Shows at Gallery I at Spring Studios on September 9, 2018 in New York City. Color! Shades! Shapes! Fluidity! These are all things we love to see in any collection of clothing, but we love seeing it even more on the runway, which is what made watching designer Prabal Gurung’s Spring-Summer 2019 presentation such a delight. Drawing inspiration from his native Nepal as well as time spent in New York, Tokyo, London and Mumbai, Gurung presented a utopian fantasy grounded in an accessibly inclusive perspective. Not surprising, since the designer—whose designs have been worn by Michelle Obama, Issa Rae, Kerry Washington and Pose’s MJ Rodriguez—was recently referred to by Washington Post fashion critic Robin Givhan as possibly the most “woke” man in fashion. 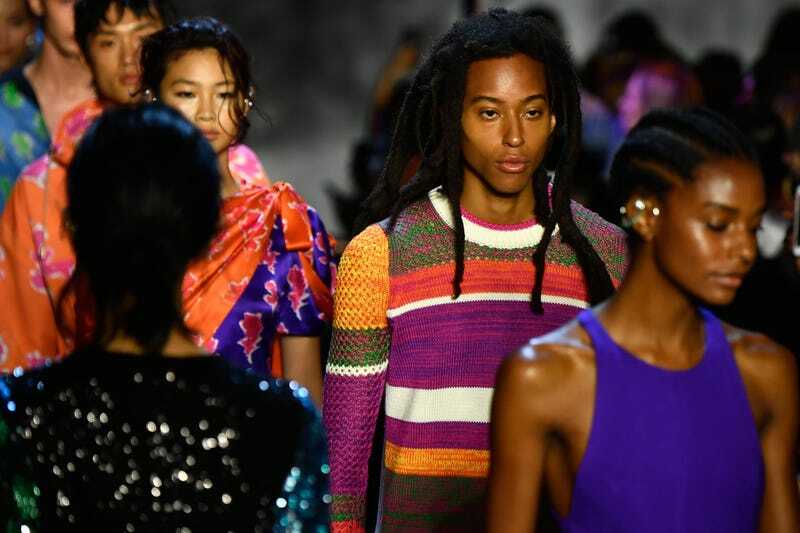 For his Spring-Summer 2019 collection, it wasn’t just the addition of plus size models that contributed to the diversity on Gurung’s runway, but a collection and cast that were multicultural and occasionally gender-fluid, bringing to life Gurung’s vision of a “cross-cultural journey, one that sees no borders.” In fact, as identified in the show’s program and reported by Yahoo Lifestyle, models from over 35 countries walked the runway in his Sunday presentation, over which hung hundreds of prayer flags. Prabal Gurung walks the runway at Prabal Gurung show during New York Fashion Week: The Shows at Gallery I at Spring Studios on September 9, 2018 in New York City. Saturated hues and cultural references from Madras plaids and Scottish highland-ready houndstooths to indigenous embroidery and Uzbek and sari-styled silks happily coexisted on Gurung’s runway. The silhouettes ranged from boxy to body-skimming, with several pieces interchangeably worn by men, women and others. For Gurung, it not only represents a “cultural shift where traditional roles, gender and identifiers are breaking down,” as he wrote in the show notes, but is a reflection of his personal style, as well. Clockwise from top left: Journalist Elaine Welteroth, Tiffany Haddish, Pose’s Indya Moore, Kelly Rowland, Karrueche Tran and Victor Cruz attend the Prabal Gurung - Front Row during New York Fashion Week: The Shows at Gallery I at Spring Studios on September 9, 2018 in New York City. In the front row? Tiffany Haddish, Kelly Rowland, Pose’s Indya Moore, journalist Elaine Welteroth and fashion-loving couple Victor Cruz and Karrueche Tran, to name a few. And on each seat, a card that said simply, “I am a Voter,” reminding Gurung’s guests that being a creative “doesn’t make us less concerned about what’s happening in the world,” as he told Givhan.